I've done the gag gifts, the romantic ones, but now that we're a little older like fine wine, I'm opting for a more refined gift giving this year. Your guy will love these fashionable and tech-friendly finds to spruce up their professional life -- affordable little splurges they wouldn't get themselves. Lapel Pin - Who says you can't buy your guy flowers on Valentine's Day? 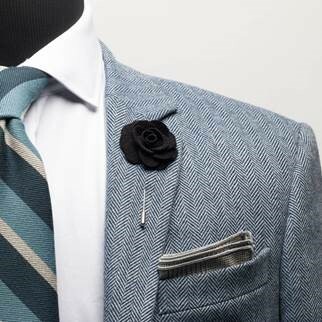 Truly unique, I love this microfiber flower pin, which spruces up a tired jacket and also works as a conversational piece too. I first spotted this attractive statement accent on my Instagram feed and especially adored how these two dapper guys boldly wore it (one, two). Best of all, it's reasonably priced, you can get multiple pins for under $20! I gave one to my cousin, who wore it to the wedding of a friend of ours. Available in lots of colors, but you can't go wrong with black, red, or gray. Sprezza Box - Fashion delivered for men! 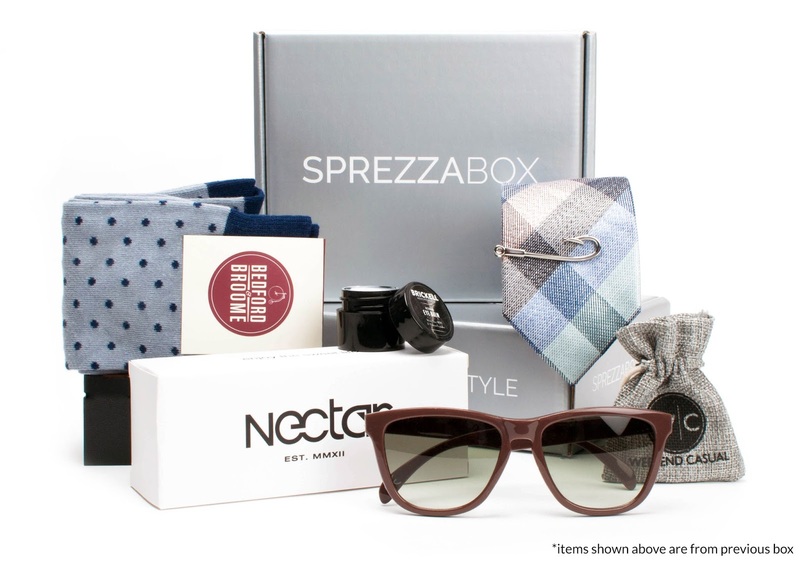 A subscription box curated by Sprezza's personal stylists will bring Valentine's Day joy to your man every month and will keep him looking sharp and trendy. Effortless Style for just $28 a month. Each box is guaranteed to have over $100 in value with 5-6 fashion and lifestyle products, so you're getting a lot of bang for your buck. You can pay upfront $300 for the entire year and save $36 or pay monthly and cancel anytime. Everything sent is his to keep! Also, they offer one-box only options, which is how we got started but loved it so much, we did the full year of fashionable items. Cord Keeper - This 3-pack of black/beige/grey leather cord keepers keeps your cords neat and stylish. Perfect for travel and work. $9.99. Echo Dot - Alexa is the only woman I don't mind my husband talking to each morning ;) We are obsessed with our Dot. We have it in our bedroom and we'll tell it to play NPR in the mornings, provide us updates on the weather, give us a flash briefing of the day's news and even play little kid music for our boys. I'm saving up to get another one for my office too and have a feeling my husband wouldn't mind receiving one for his either. $49.99. Wooden Bow Ties - Yes, bow ties and neckties made out of wood! My husband came back from Vegas purporting that men at the convention he attended were donning them and that they were getting a lot of positive attention for it. Definitely a conversation starter and great for the rugged gentleman in your life. $14.99 and up. We have the big echo and LOVE Alexa. My husband has way too much fun with her LOL. 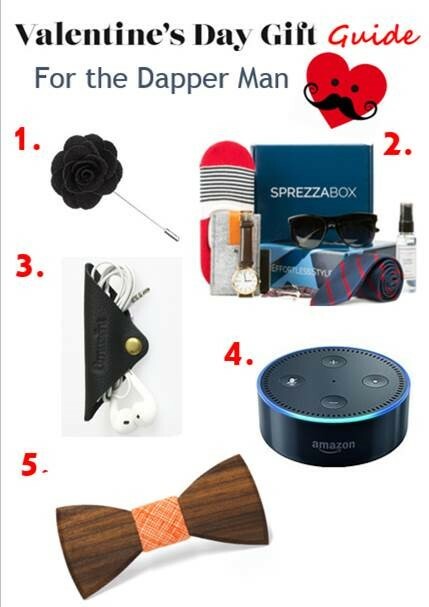 Never heard of a sprezza box but what a really unique way to add fashion and cool guy things each month! Totally checking out the subscriptions options now! These are great ideas! We just got The Echo Dot as a gift from our cousins and we're LOVINGGGGGG her! These are great ideas. If I had a hubby or boyfriend, these would definitely be on the top of my list! I don't have a man to shop for at this time :(. But I do love my Echo Dot! That will make a great gift! I never woudl have thought of an Echo for a gift! These are great gift ideas for any man! That subscription box seems awesome! I know my guy would love tons of those items! All great ideas. I love the idea of the Amazon Echo! It's actually on my hubby's list. Too bad, I got him an Amazing Echo for Christmas. Now I have to think of something else. My husband has a wooden watch he gets compliments on all the time! It doesn't look very comfortable, but suffering for fashion isn't new and it think it's awesome so the bow tie is happening! These are some really great ideas! I have always wanted to get my hubby one of those wooden bow ties! What a great gift guide. I know my husband would go for a few of these. Thanks for sharing. I a at such a loss with what to get my husband for Valentine's Day. Thank you for these great ideas!! The Sprezza Box sounds pretty cool. My boyfriend would really like this one. I need to check it out! I have been thinking that we need to pick up an Echo Dot for our house and you just helped me make up my mind! I love this list. Its so hard to get men V-day gifts! I love the sub box for men that will keep him jazzy! So many great ideas. Whenever I've had a man in my life for V-day I tended to get him a card and make him a special dinner. I like all of these ideas! Too bad I don't have anyone to give them to. I really like the bow tie and that echo dot! We got the echo dot for Christmas and my husband really loves it. I'll have to check out the cord keeper though. I love the Spreeza subscription box idea. This will keep my Valentine looking stylish all the time. Thanks for sharing.